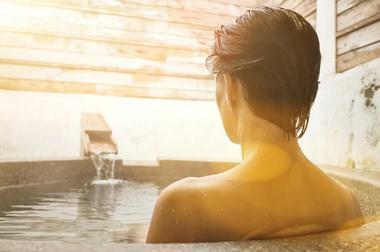 Soaking in warm, mineral-rich water surrounded by the beauty of nature – what could better? Idaho has an array of hot springs and mineral pools in both resorts and in the natural environment, which are open for the public to enjoy. Some are easily accessed by hiking trails or dirt roads, while others can be savored in the luxury of a resort with special extras such as spa treatments massages, comfortable accommodations, and award-winning restaurants. 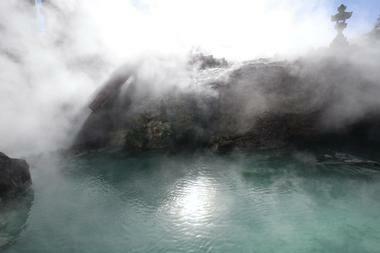 Visitors flock to the pools to soak up the healing geothermal waters and spend time soaking, relaxing, and having fun. 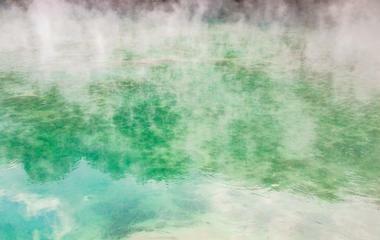 Here are some hot springs in Idaho Springs to head to for some rejuvenation. 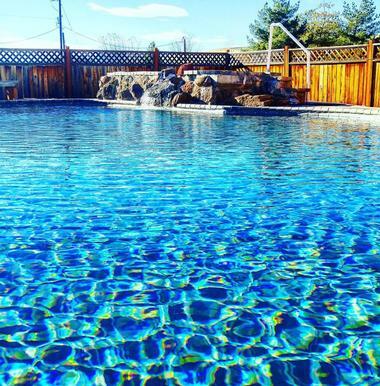 Aura Soma Lava Hot Springs is a family-friendly vacation village with guest rooms and rental homes and a hot springs pool at the center of the retreat. Located alongside the Portneuf River, the hot springs pool rests beneath giant evergreen trees and offers a relaxing and tranquil experience with waters ranging between 102°F and 105°F. Aura Soma Lava Hot Springs also has beautifully manicured gardens and grounds, an intriguing labyrinth, and a lovely riverfront meadow in which guests can relax. Accommodation is available at Ash Lodge in downtown Lava Hot Springs, which is within walking distance to all of Lava's main attractions and several vacation homes that can be rented for various periods of time. 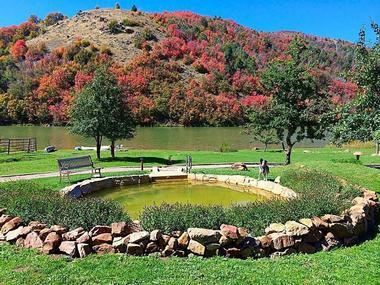 Located on the beach of the Northeast corner of Bear Lake in St Charles, Idaho, Bear Lake Hot Springs features several hot springs and camping sites with beautiful views of the lake. The campground has two large mineral pools with warm waters of between 102°F and 105°F, as well as offers a range of activities to enjoy on the lake, such as boat rentals and watersport equipment rentals. Sea-Doo rentals are also available on-site at the beach area, and the campground has a fast-food grill and camping supply store located inside the main office building of the site. Burgdorf Hot Springs is a rustic resort tucked away in the mountains of Idaho that features several mineral pools with temperatures ranging between 105°F and 113°F. Open to the public daily, 365 days a year, the hot pools are located north of McCall and are listed on the National Register of Historic Places. Surrounded by pristine forests and rolling meadows, the hots springs consists of two pools – a huge warm water pool and small “hot pot” – and there are also a few rustic cabins available for rent. The springs are accessible by cars or off-road vehicles during the warmer months and snowmobile and tracked UTV in the snow-bound winter months. Located in the Sawtooth National Forest near Stanley, the Elkhorn Boat Box Hot Springs are unusual and unique hot springs because when the natural springs submerge during the spring run-off, the warm water can still be enjoyed in a wooden soaking box tub that is usable all year long. 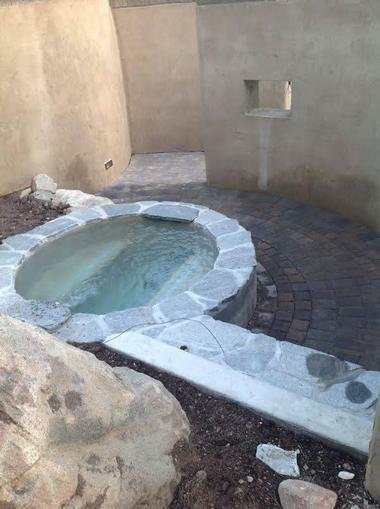 The riverside hot tub must be filled with water and the temperature adjusted by bringing cooler water in with a bucket, and it comes with sunken seating for additional comfort. 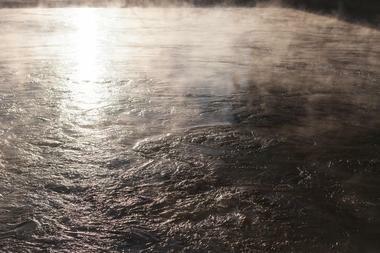 When the river is low, there are one or two seasonal pools that have scalding hot 136°F water that is cooled by the river water, making for a relaxing spot. The pools are near the eastern Sawtooth trailheads and are easily accessed by hiking. 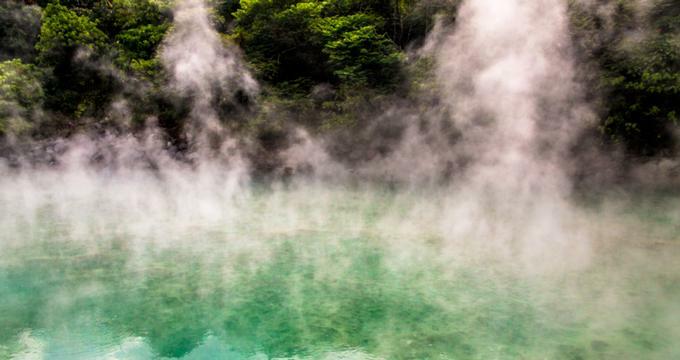 Nestled in the Smoky Mountains of the Sawtooth National Forest, Frenchman’s Bend Hot Springs are natural hot springs located 11 miles west of Ketchum. Also known as Warfield Hot Springs, Frenchman’s Bend Hot Springs are thermally heated mineral pools with temperatures of up to 110°F filled with water from three different springs. One of the pools is situated on the roadside of Warm Springs Creek, while the other two are on the other side of Warm Springs Creek and can be accessed by wading across the creek. The Frenchman’s Bend Hot Springs are set in the heart of the pristine Sawtooth National Forest and are surrounded by dense forests and a network of hiking and mountain biking trails. Surrounded by the beautiful foothills of the North Fork Range in the small town of Donnelly, Gold Fork Hot Springs features hot and cold mineral-rich pools that are open to the public year round. Connected by geothermally heated sidewalks, the springs feed six different pools formed by natural rock formations in a flow-through system with varying temperatures, ranging between 85°F and 110°F. Some of the pools have hydrotherapy jets to offer additional relaxation, and the facility provides suits and towels for rental as well as free lockers and heated changing rooms. Set along Warm Spring Creek in the Salmon-Challis National Forest about 20 miles south of Salmon, the Goldbug Hot Springs feature six waterfall-fed pools with varying temperatures up to 113°F. The natural mineral pools are dammed by rocks and boulders, have sandy or gravel floors, and flow into the Salmon River. Open year round and free to the public, the Goldbug Hot Springs can be accessed by vehicle from a well-maintained dirt road or by hiking along the trail, which features sturdy bridges and a few stairs. There are numerous primitive campgrounds along the path, and there is a campground above the highest pool along Warm Spring Creek. Nestled on the South Fork of the Payette River, Kirkham Hot Springs is a legendary hot spot that is one of many along the Ponderosa Pine Scenic Byway. 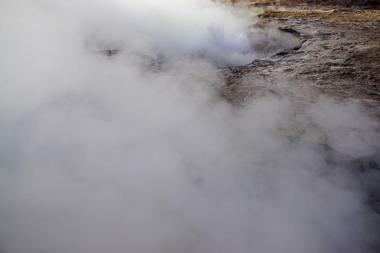 Situated below a highway campground, a small wooden staircase leads down to the hot springs and geothermal soaking pools of varying temperatures. The pool also features small steaming waterfalls where hot water pours over the cliff into pools below and feels like a natural shower. There is a campground with primitive campsites near the falls as well as vault toilets, and the campground and mineral pools can be reached by driving or hiking in the summer or snow-hiking or snowmobiling in the winter. Named for its numerous hot springs that are famous for bathing, swimming, tubing, and canoeing, Lava Hot Springs is a city in Bannock County. Located on the old route of the California and Oregon Trails in the mountainous valley of the Portneuf River, Lava Hot Springs features several aquatic and water parks with pools filled from geothermal hot springs boasting temperatures ranging from 102°F to 112°F. An indoor aquatic center has a six-lane 25-yard pool as well as an aqua climbing wall, a hot pool with a diving board, and the Portneuf Kiddie Cove, while the outdoor complex has an Olympic-size swimming pool, diving platforms, water slides, and an indoor pool. Set along the banks of the Bear River in the scenic Oneida Narrows Canyon at the north end of Oneida Narrows Reservoir, Maple Grove Hot Springs features three large soaking tubs and one large therapy pool along with a 14-foot rock and mortar tub with a rock bench. The Southern Idaho retreat also offers a variety of other amenities, including overnight camping and lodging in two yurts, a fully equipped kitchen, restrooms with changing room, hot showers, and toilets, small boating facilities, and a snack bar. Nearby attractions range from the Caribou-Targhee National Forest and the Oneida Reservoir to Bear River and the cities of Montpelier and Preston. 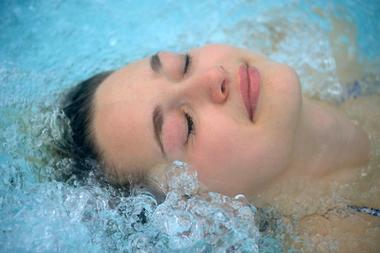 Miracle and Banbury Hot Springs are located near Miracle on the beautiful Snake River. The springs offer year-round relaxation and rejuvenation with a constant flow of natural hot spring water rich with minerals. The springs have been providing healing geothermal mineral waters to the public since 1920, with several large swimming pools and private baths heated by mineral water bubbling up from the earth at 138°F. 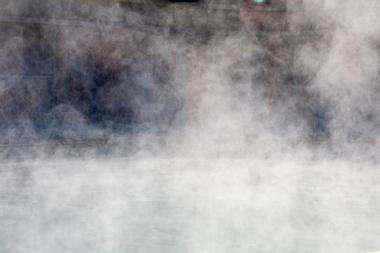 The water is then cooled to a comfortable temperature with cold water from the Snake River aquifer. The Miracle Springs feature 15 private pools, six VIP pools, and four large outdoor pools with chemical-free geothermal waters for the public to enjoy in both summer and winter. The Mountain Village Resort is a family-friendly retreat in Stanley, Idaho, that features a large concrete soaking pool with a sandy bottom that is filled with warm mineral waters of varying temperatures of between 103°F and 106°F. The pools are covered so they can be enjoyed throughout the year and there are changing rooms with beautiful views of the Sawtooth Mountains. Other facilities at the Mountain Village Resort include overnight lodging, a family-friendly restaurant, and a convenience store that sells camping essentials, souvenirs, and gifts. Nearby attractions include the Sawtooth Mountains and National Forest, the Salmon River, the White Cloud Mountains, and the Frank Church River of No Return Wilderness. Mundo Hot Springs is a simple family-friendly resort featuring comfortable accommodations, tent camping, RV sites and trailer cabins, and a hot, spring-fed swimming pool. The pool is filled with warm, geothermal water that is piped directly from the hot spring to the resort’s pool and spa and it is cleaned once a week. Mundo Hot Springs features a variety of accommodation, ranging from simple hostel-style lodgings to fully equipped trailer cabins and a grand pool house. 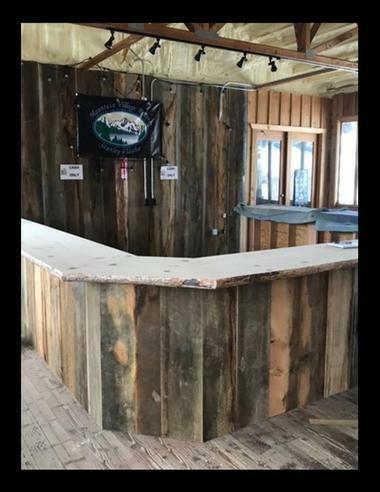 There are also camping facilities for tents and RVs with electricity, water and waste hookups as well as an onsite bistro that serves home-cooked food and drinks for breakfast, lunch, and dinner. The Riverdale Resort is a family-friendly resort with several swimming pools filled with warm geothermal waters from the local hot springs. Located 5 miles north of Preston in the beautiful Riverdale Valley, the Riverdale Resort’s natural mineral hot springs can be enjoyed in four swimming pools of varying size, which have two water slides and an array of fun. Pools include both small and large mineral soaking pools, which range in temperature from 90°F to 105°F to a junior Olympic pool with geothermal hot water and a maximum depth of 10 feet. 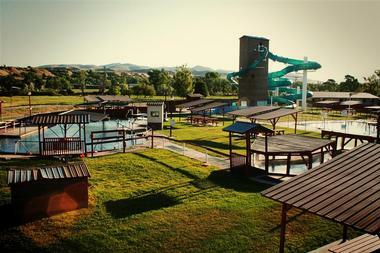 The resort also has two Hydrotube water slides, which descend over 60 feet before emptying into the pool, along with covered picnic areas with barbecue grills, picnic tables, and chairs, and play areas for children. 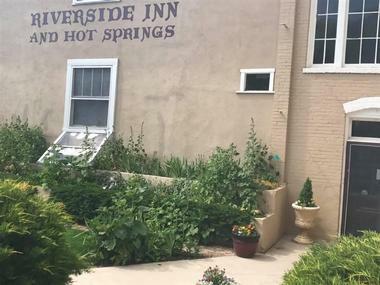 The Riverside Inn and Hot Springs is a historical adult-only boutique hotel located in downtown Lava Hot Springs next to the Portneuf River. The stylish inn features beautifully appointed, individually decorated guest rooms with modern decor, an award-winning restaurant and lounge, and a relaxing spa with mineral hot springs. Built in 1914 and known as “The Honeymoon Hotel,” the resort is listed on the National Register of Historic Places and is renowned for hosting several famous people, including President Theodore Roosevelt. The exclusive spa features healing hot mineral springs with chemical-free geothermal waters with temperatures ranging between 102°F and 106°F. Located about an hour and a half from Boise, the Rocky Canyon Hot Springs is located along the Middle Fork Payette River in the Boise National Forest. There are four primitive and rustic hot spring pools, which are surrounded by rocks and boast varying temperatures, cooled by the river water cascading down a cliff into the pools. Rocky Canyon Hot Springs is relatively secluded, hidden by large rocks and the rising steam from the waters, and can be accessed by fording the river. The Royston Hot Springs is nestled in the Sweet Valley and features a natural hot springs indoor pool and a large jetted hot tub. The pool and the hot tub are filled with mineral water welling up from the ground at 140°F and cooled to 98°F for the pool and 104°F for the hot tub. Royston Hot Springs also features the Spring House, a large 3,500-square-foot building that can be hired for special events, which features full kitchen facilities, a banquet area with a stage, and access to bonfire pit with picnic tables. The resort also has a campsite with a tent camping area and ten full hook-up RV spots, a games room, restrooms and showers, and coin-op laundry facilities. 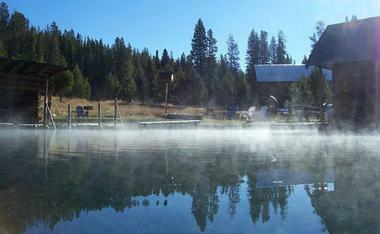 The Springs is a hot springs retreat in the historic mining town of Idaho City. Located just a short drive northeast of Boise, the resort features a state-of-the-art pool fed by a natural geothermal hot spring water. The resort has sizeable open-air swimming pools and private hot tubs and baths and provides an array of amenities such as towels, lockers, toiletries, non-alcoholic beverages, heated and air-conditioned dining and massage yurts, picnic areas for outside food and floaties on Sundays, Wednesdays, and Thursday evenings. The Springs features a seven-room hotel situated just down the road from the hot springs with comfortable guest rooms and modern amenities for overnight stays. The Trail Creek Hot Springs is located northwest of Cascade, Idaho, and has two geothermal hot springs, a primitive campsite with a firepit, and several hiking trails. The smaller first pool is approximately 10 feet wide and 3 feet deep, features a rock wall with a rock and sand bottom, and is filled with hot water that slides down colorful algae-laden rocks. The second pool is around 8 feet wide and 2.5 feet deep and has a rock wall and a sandy bottom and is filled with hot water from the pool below. 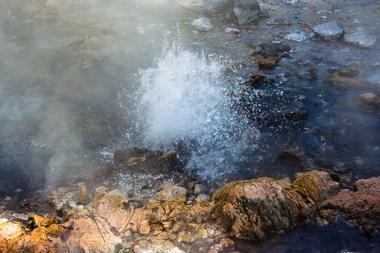 Both pools are surrounded by dense forest and rising steam, creating a tranquil and secluded spot for relaxing. There are several campsites with fire rings slightly above the springs, and the Boise National Forest camping areas and campground are nearby. Located in New Meadows, Zims Hot Springs features several outdoor pools filled with hot geothermal mineral waters with temperatures ranging from 90°F to 106°F. 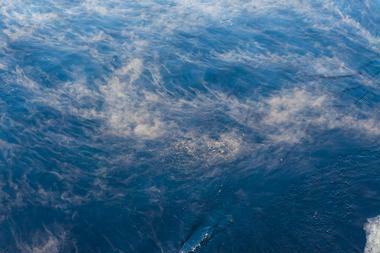 The waters are cooled by the waters of the Little Salmon River and are treated with chlorine for hygiene reasons. The springs include an outdoor soaking pool with a temperature range of between 103°F and 106°F and an outdoor swimming pool with warm waters between 90°F and 100°F. Other facilities at Zims Hot Springs include picnic areas, changing rooms, locker rooms, a campground with tent and RV pitches, and a snack bar.